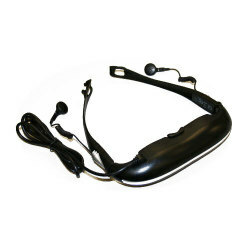 Wireless Eyewear for Game consoles: Wii, PSP, XBox, DVD and VCR Players $91.25 shipped via coupon code DG17. Expires 05-31-2009. The iTheater features a sleek, ergonomically comfortable and lightweight design - but don't let the small package fool you. All the necessary electronics and optics have been integrated into this compact, stylish, video-eyewear product. You just simply plug this wireless eyewear into your favorite video source (DVD, VCR, Game Consoles) with the included AV cables. The combination of video microdisplays, adapters, surround-sound stereo and battery pack, make it ideal for consumers to privately view theater-quality video, photos and websites from small mobile devices such as cell phones, portable DVD players, and personal multimedia players.